The history of Pick Szeged Zrt. dates back to the 19th century. During nearly 150 years Pick has been a significant player in the European food industry market and has been the leader of the Hungarian meat market, offering excellent quality products widely known and appreciated all over the globe. Pick Szeged Zrt. have the largest dried meat manufacturing capacity in Central-Europe and its scope of activities covers the entire meat industry verticum from slaughtering to the wholesale and retail distribution of meat and meat products. As member of the Bonafarm Group it is crucial for us to use Hungarian raw materials, employ Hungarian labour and to produce excellent quality meat products while remaining a Hungarian-owned company. In Hungary PICK is the best-known meat industry brand name. We actively export to 35 countries; we have our subsidiary company in Germany and a trade representation office in Japan. Each year we produce nearly 40,000 tons of meat products. Our product selection includes premium products satisfying wide-ranging market needs: salamis and dry sausages, cold cuts, liver pastes, frankfurters and meat products made from the unique Mangalica pork. Pick is the largest Mangalica meat producing business in the world. 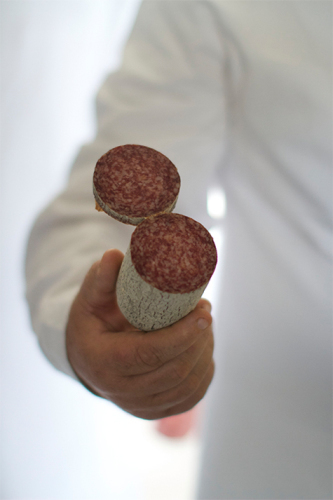 The flagship product of our company is the world-famous PICK Original Wintersalami. This uniquely Hungarian product has been made according to the original secret recipe of Márk Pick for over 147 years. The strategic objective of Pick Szeged Zrt. is to meet the needs and requirements of our customers by continuously improving our manufacturing technology focusing on environmental protection. Excellent quality, carefully selected raw materials and compliance of the work processes with strict quality assurance system of criteria guarantee that at the end of the manufacturing process excellent quality products are brought to our consumers. The company was founded by Márk PICK, an agricultural trader who learned the skills of salami-making from Italian maestros. Large scale production started: the riverside microclimate turned out to be a great environment for salami manufacturing. Pick Salami is recognised with the award of a diploma at a trade fair in Saloniki. At the Brussels World Fair Pick wins a diploma of merit Exhibition in Brussels. The average annual output of the factory reaches 3,000 - 4,000 tons. The commencement of manufacturing of other salami variants. Output grows... However the factory becomes a state property. The most modern technology available is being installed. Output of salami to exceed 10,000 tons. Pick becomes a publicly quoted company. ISO 9001 granted and all manufacturing processes comply with it. Ringa bacon factory and brand is purchased by Pick. Company Szegedi Paprika is purchased by Pick. Merger of Pick and Délhús for a complete meat product portfolio. Representative office opens in Japan. Pick restarts exports to the United States. Pick Szeged is member of the Bonafarm Group, Hungary's largest food processing integration. Herz brand is acquired by Pick.